The Vegan Magpie: Nakd and Trek bar offer! Hello! Wimbledon has started! 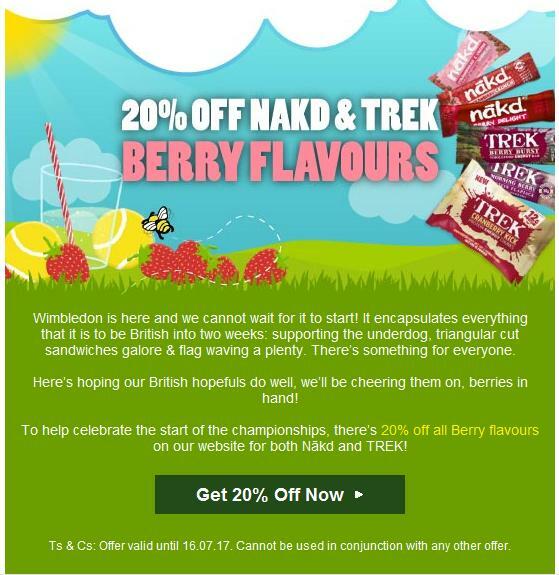 Also, Nakd/Trek have 20% off all of their berry flavours because of the tennis until 16th July 2017. Just head here: https://goo.gl/bvRb5y The discount is already taken off all berry products that aren't in any other offer or mixed boxes. Just get shopping for your berry favourites. Don't forget, Nakd/Trek offer free postage! Yay!